Provide comfort for the family of Claude Hanyon with a meaningful gesture of sympathy. 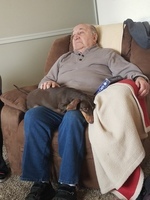 Claude Edward Hanyon, 80 of Springville, Utah passed away on January 1, 2019 of congestive heart failure. He was born August 10, 1938 in Binghampton, New York to Llewellyn Hanyon and Bess Irene Shroeder. He proudly served in the United States Navy and was stationed in San Diego, California. He was married to Beverly Herold for 53 years. He worked as lead housekeeper at Orem Community Hospital and worked at the Frankly Covey Center in Provo as a facility manager. He enjoyed fishing, camping, cooking and long road trips. He is survived by his wife Beverly Hanyon, daughters: Cindy Evans, Cheri Paxton (Darrell) and his sons: Michael Hanyon (Tiffany) and Mark Hanyon. 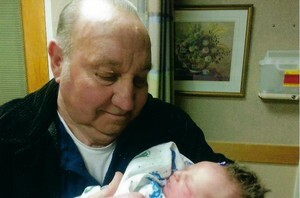 He had 11 grandchildren, 8 great-grandchildren and was preceded in death by one grandson, Cole Michael Hanyon. Thank you to IHC Hospice, Marike Jacobson and Margaret Talker for helping us through this hard time. To send flowers in memory of Claude Edward Hanyon, please visit our Heartfelt Sympathies Store. Burial at Spanish Fork Cemetery 1:00 p.m. Provide comfort for the family of Claude Edward Hanyon by sending flowers.